"I'm Sorry, You're Too Stupid To Collect Unemployment"
The House "reform" of unemployment insurance, which is included in its payroll-tax extension bill, is actually a reduction in benefits. Right now you can collect unemployment insurance up to 99 weeks. Under the House bill, you can collect only up to 59 weeks. By this logic, if you have a loaf of bread and I slice off two-fifths of it then what you're left with is reformed bread. You're welcome! Or so I thought. But it turns out that this Republican measure actually does include, in addition to the 59-week limit, a few changes to how unemployment insurance is handed out. These will have the effect of reducing spending on unemployment benefits, but that isn't their purpose. Their purpose is to make people who receive unemployment benefits understand that they are losers, and must be stigmatized and harrassed until they prove themselves worthy. As Mark Schmitt points out, this is a strategy previously applied to welfare recipients. Schmitt observes that there was at least some logic to stigmatizing and harrassing people on welfare. 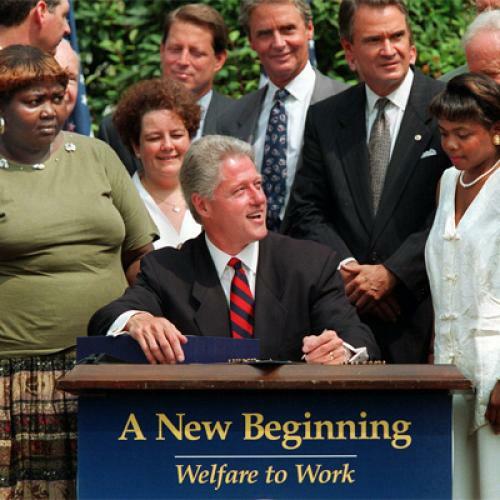 The government was trying to undo the cycle of dependency, tangle of pathologies, etc., etc., all in the interest of getting poor people off welfare and into a job. Welfare recipients were the unvirtuous poor. The working poor, meanwhile, were the virtuous poor. President Ronald Reagan and especially Bill Clinton sought to reward their "playing by the rules" by expanding the Earned Income Tax Credit. These were the folks that everybody, conservative and liberal alike, wanted to help succeed. But conservatives now regard the working poor as morally indistinguishable from welfare recipients. It has therefore become necessary to stigmatize and harrass this group, too. The Republican crusade to force low-income "lucky duckies" to pay income tax was the fist hint of this new paradigm. Unemployment insurance reform is another. To collect unemployment insurance you have to work. When you take a job your employer pays into a state unemployment-insurance fund. Practically speaking, it is part of your compensation; it just happens to be a part that you never see, pay taxes on, or have to account for. If you lose your job this insurance covers you for up to six months. If you still can't find a job after six months the federal government will pitch in with additional benefits to cover you up to nearly a year and a half more. When the economy is in recession, or recovering from a recession, as it is now, unemployment goes up (right now it's 8.6 percent) and jobs become especially hard to get. This isn't rocket science. The GOP-sponsored House bill (text) reforms this situation by 1.) loosening requirements on how states spend federal unemployment funds, which flow through them; 2.) tightening the requirement that all benefit recipients look for work (mandatory job interviews, etc. ); 3.) allowing states to require recipients to pass a drug test; and, 4.) enrolling those who lack a high school diploma or GED in a GED program (enrollees also have to be "making satisfactory progress in classes"). These last two interest me most, but especially the GED requirement. Requiring a drug test establishes that if you are collecting unemployment you are probably a disreputable character. It's morally repellant, but not particularly novel, since companies now routinely require lower-tier workers to piss into a jar as a condition of unemployment. (Upper-tier workers, apparently, never take drugs.) Many who are required to provide urine samples will have experienced this ritual humiliation before, and be relatively inured to it. The GED requirement, on the other hand, is a new way to communicate that if you lack a job you must be deficient. Now don't get me wrong. I'm as concerned as the next guy about the fact that the high school graduation rate hasn't increased in decades. If you don't have a high school diploma, or a GED, you're going to have a very difficult time getting a job. But if someone is collecting unemployment who lacks either of these things we know that person managed to get a job in spite of this educational deficit--otherwise he or she wouldn't be on unemployment. To require this person to enroll in a GED program as a condition of collecting benefits is in essence to say that you had no business being in the labor force to begin with. I can imagine that it might pose all sorts of practical problems simultaneously to start a GED program, look for a job, and jump through all the other hoops you need to to shake your unemployment check free from the state bureaucracy. Wouldn't it make more sense to focus on getting yourself a job, and then enroll, if circumstances allow, in a GED program? If you're employed, have no high school diploma or GED, and aren't enrolled in a GED program, you don't get to opt out of the unemployment insurance program. You can't tell your boss, "Hey, give that money to me, not to the state, because I don't have a GED and I don't intend to get one even if I lose my job." You just pay into the insurance pool just like everyone else. It's the same if you're a drug user. You don't get to tell the state not to collect unemployment insurance on your behalf because you smoke weed in your off hours and will continue to do so even if you lose your job. I'm not suggesting that high school dropouts and drug users be given such an opt-out; obviously that would undermine the solvency of the state unemployment insurance fund (which is probably pretty shaky to begin with). What I'm saying is that it's unfair to impose conditions on drawing from an unemployment insurance fund that don't exist when you're paying into it. And it opens the gates wide to imposing all sorts of other petty conditions whose real purpose would be to further stigmatize and humiliate people whose sole offense to society is that they once had a job and then lost it.